More than 65% of employees in the US workforce are physically but not mentally present in the workplace and this lack of engagement costs the economy more than $450B in lost performance, productivity, and profitability. What’s the cost to your organization? Which of These Builders are in Your Organization? Brick layers put in their time day after day but don’t think about how their work supports the whole structure. These brick layers are among the 16% of workers who are actively disengaged. They don’t’ feel valued for their efforts or connected to the end result. They act as if they are working alone. They are the first ones to call off when the weather forecast is threatening and working slowly is their forte. Wall builders see only what’s directly in front of them and their efforts stop there. Wall builders are among the 51% of the workforce who are simply not engaged. They do just what is required and no more. They don’t offer ideas and are not interested in developing their expertise. Wall builders plod along finding reasons to work harder, not smarter. Cathedral builders see the big picture, are bursting with purpose and passion, and understand the value of their work. Every brick they touch is carefully placed and perfectly aligned and they are willing to help others in their drive to make the dream into a reality. 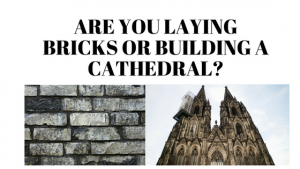 Cathedral builders want to learn all they can about cathedrals and to collaborate with their team to find the most efficient and effective processes to follow. We need more cathedral builders; they make up only 33% of the workforce. How does their work ethic and attitude impact productivity, performance, and profitability? How do each of these builders represent your company? How long do they stay with the company? Which of these builders will willingly go above and beyond when necessary? Simon Sinek, author of Start with Why, states “When people are financially invested, they want a return. When people are emotionally invested, they want to contribute.” One way to nurture emotional investment and to cultivate cathedral builders is to help your employees discover their personal mission. I add value by carefully placing and aligning each brick for maximum support and by helping my fellow workers with my expertise and guidance.